Forest River Cherokee Arctic Wolf 265DBH8 bunkhouse fifth wheel. When you enter this 26ft bunk house, you will find great storage throughout the unit. A super slideout in the main living with a dinette and sleeper sofa. Across from the slide out is a full kitchen equipped with stainless steel appliances, a residential refrigerator, and single bowl sink. The Double bunks are located along the back wall & can sleep up to 4 people. Walk up the steps to a full bathroom with a corner glass shower, toilet & sink. A second slideout opens up the bedroom and bathroom giving you extra storage space between the bedroom and bathroom. The Master bedroom is equipped with a power lift system master bed; nightstands on each end and excellent headspace. The Arctic Wolf by Forest River is equipped with interior and exterior LED lights, blackout roller shades, gel-coated fiberglass front cap, heated & enclosed underbelly, outside tv bracket with hookups and many more great options. 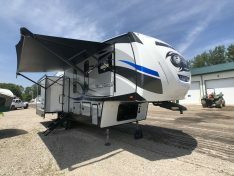 Contact Tri City RV Sales today for more information!